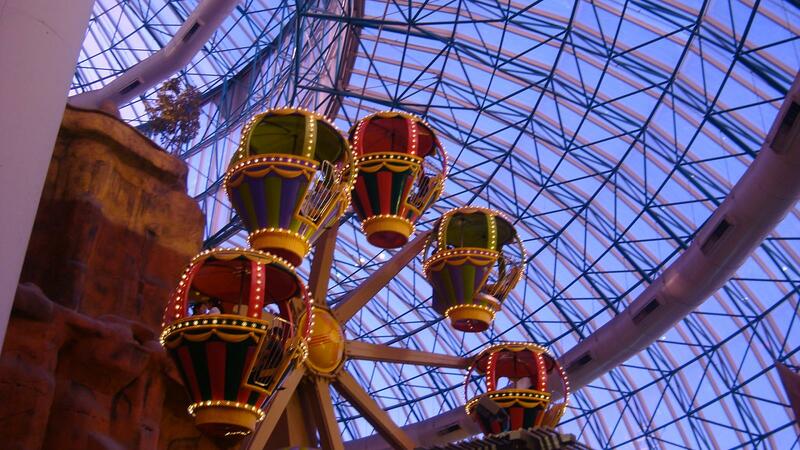 Take the kids to the AdventureDome in Las Vegas for family fun! How true are those words? Think of your own childhood, you remember the memories made and the time well spent as a family more so than any lavish toys you had. Most people think Las Vegas isn’t the place for kids but as someone who grew up in Vegas there is plenty to do with the kids. These are my favorite “on strip” ideas that are well worth your time to travel there – some of them are even better than the “adult” things on the Strip! The $60 million Shark Reef Aquaurium at Mandalay Bay (all ages) opened in June 2000 at the Mandalay Bay Hotel & Casino and houses hundreds of animals ranging from Komodo Dragons to Piranahs to Jellyfish to Sharks and everything in between! It is home to several endangered species that you may only see once in a lifetime. It takes about an hour to walk through but with the ticket purchases you are welcomed to stay as long as you’d like. There are incredible things to see and do during the tour, our son’s favorite area is a place where there is a shallow pool full of stingrays that you can touch and if you want to dish out a little more money you are able to experience one of the “Animal Encounters” programs where you are able to feed the stingrays, turtles or sharks yourself! (For pricing & program info, visit their website here). Lastly, if you are a certified scuba diver you are able to dive with the sharks for an encounter you’ll never forget. Get more info and pricing. Nevada residents receive a discounted rate. Prices range from $20 adults, $18 seniors 65 and older, $14 for kids 4 to 12, free for children 3 and under. Next up, Las Vegas’ Container Park is appropriate for ages 2-12 for the play area, all ages for food & shopping and is free! This one-of-a-kind play area that was opened in December of 2013 was constructed of 43 re-purposed shipping containers and 41 locally manufactured Xtreme cubes and includes a Treehouse with a 33-foot-tall slide! The play area features a NEOS play system to get your kids moving and to have fun doing it! While the kiddos are having a blast in the gated playground, mom & dad can go to all the boutique shops for a little shopping and grab a meal at one of the many dining options. Through out the year they have live entertainment. Check their online calendar for their latest events. Parking can be a bit tricky as there is no parking lot for the Container Park but there is metered parking around the outside of the park, in all honesty it’s probably best to take a taxi cab. To be fair, it’s not technically on the Strip, it is downtown but about 10 minutes North of the Stratosphere Casino. You could easily spend a couple hours here shopping, dining and enjoying any entertainment that might be going on. You could easily spend all day in Las Vegas’ AdventureDome at Circus Circus (All ages) riding rolling coasters, playing laser tag, a game of mini golf anyone? This unique indoor amusement park is an action packed fun filled day for kids of all ages. They provide kiddie rides for the youngsters, family rides everyone can enjoy and extreme rides for the adrenaline junkie! It’s connected to the Circus Circus Hotel & Casino but provides a family friendly environment. The all-day wristbands are probably your best deal as far as bang for your buck at $32 for a regular admission and $18 for a junior (juniors qualify as being 48″ and under). Pricing and hours can vary greatly, check the AdventureDome website in advance. Don’t forget to check the website’s latest list of rides and attractions to see what’s suitable for your kids. The Midway at The Circus Circus in Las Vegas (all ages) always provide an awesome time for people ages 2 to 100! It has carnival style games with prizes up the wazoo! I would recommend planning to be here 1 to 2 hours, depending how addicted to the game playing you get. Expect to pay $1 to $3 per game. There is also an arcade within The Midway you can also enjoy but there are no prizes to be won there. At 11 am everyday there are FREE world class circus acts for you to enjoy. This is a great place to take the kids for some fun and to feel like a kid again yourself! The Fun Dungeon at The Excalibur(all ages) is similar to The Midway, with carnival style games for a chance to win prizes and an awesome arcade to enjoy. Games also cost $1 to $3 per play. The Fun Dungeon is located at the South end of the Strip (The Midway is on the North end) inside the Excalibur Hotel & Casino. There are more than 150 games and 65 arcade games. Our family prefers The Fun Dungeon over The Midway cause we think the games and prizes are better, plus there is more to do at The Excalibur after you’re done playing all those games! Located at the Mirage Hotel & Casino in Las Vegas, Siegfried & Roy’s Secret Garden & Dolphin Habitat (all ages) is by far one of our most favorite things to do in Vegas. It is a fun, entertaining and educational experience. The garden and habitat is home to Bottlenose dolphins, leopards, white lions & white tigers. The dolphins have a large pool where they perform tricks that will leave you in awe. There is also a trail you can take that heads underground to the bottom of the dolphin pool and you can watch from windows for a bottom level view of them diving deep down in the water swimming & playing. There are different experiences for purchase (painting with the dolphins, yoga with the dolphins, trainer for a day etc.) that can be found here. The passes are good all day and good for re-entry. A day of fun runs $22 for adults, $17 for kids 4 to 12, children 3 and under are free. The New York New York, The Big Apple Roller Coaster (anyone 54″ or taller) ride only lasts a couple minutes but the memories will last a lifetime! The first plunge of this ride is so steep I actually lost my voice while screaming on the way down. The Big Apple reaches speeds up to 67 mph on the Vegas Strip and will leave you breathless. The screaming fun rns $14 per ticket or $25 for an all day ride pass. Get the pass for all day adventure! I give Bodies – The Exhibition (ages 10 & up) a minimum age of 10 because although none of the bodies are presented in a scary or disrespectful way, I do believe some of the displays can be a little traumatic for younger kids. This exhibit features real human bodies and organs displayed in various rooms each room serving a different purpose to teach you about the skeletal, muscular, respiratory & circulatory systems. There is a room that also displays fetuses and babies to showcase the different stages of pregnancy. The entire exhibit is highly educational and very interesting. It takes about an hour to walk through and audio guides are available for an additional $5. Admission runs $32 for adults, $24 for children 4 to 12, and children 3 and under are free. I must confess, I’m partial to the Titanic: Artifact Exhibition (all ages) exhibit because I’m completely obsessed with everything Titanic! That being said, to miss out on this would be a tragedy (am I being a bit dramatic here? Probably). This exhibit is so rich in history, education & experience. This 25,000 square foot display includes over 250 authentic artifacts recovered from the actual Titanic wreckage located miles below the Atlantic Ocean. There is even a re-created Grand Staircase and a Promenade Deck that you can walk on complete with frigid temperatures that re-create the atmosphere from that April night. It takes about an hour to walk through and you can grab an audio guide for an additional $5. Admission runs $32 for adults, $24 for children 4 to 12, and children 3 and under are free. Sometimes there are combo ticket offers for additional savings. Who says Las Vegas isn’t for kids? These are just a handful of the fun & educational activities for children around the city. Let some of these be lasting memories that you give your family while vacationing in the Entertainment Capital of the World.